along with expert answers by Affinity Air Conditioning. Q: Why should I hire Affinity Air Conditioning? We deliver over 10 years experience in the heating and air conditioning industry. We pride ourselves on getting to know our customers on an individual basis & provide them with a top-notch service that our community has come to expect from Affinity Air. Our prices are very competitive and our service is the best in the business. Q: How long will my new air conditioner and/or heater last? should last 12 to 15 years. Routine maintenance helps ensure both energy efficiency and performance for many years to come. Q:Will my new air conditioner come with a warranty? 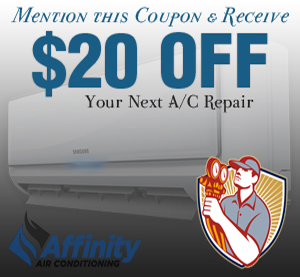 Systems installed by Affinity Air Conditioning come with a one year labor and limited warranty on parts. Contact us for specific details on coverage of your cooling system. Q: How much will it cost to install a new air conditioner? It is impossible to estimate our price without first checking conditions at the job site. We simply can not determine costs prior to inspecting a residence or office space first. Prices depend on square footage, SEER rating, construction & location of equipment. Affinity Air Conditioning offers free of charge, on site consultations and written quotes. Often we deliver an immediate written quote plus several options to choose from. Q: Is there any real difference between brand names of air conditioners? Yes. There are major differences. We recommend Bryant & Maytag air conditioners. Call us today and we will help you decide which product is right for you. Q: After I have a new air conditioner installed will it require any maintenance? Yes. We suggest that if you have a combination heating and cooling system you have us come out and do a tune up on the system every six months. Keeping these system clean is the name of the game. As the coils and blower wheels begin to get dirty & the efficiency of the system plummets, the energy bill climbs, and your comfort level drops. Regular tune ups also extend equipment life and help to prevent mechanical break downs.